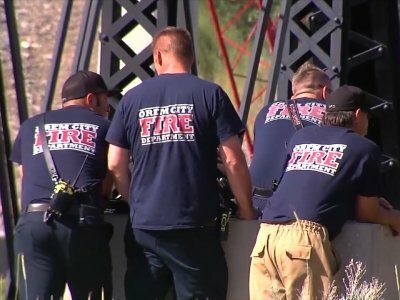 Utah officials say they may have found the body of a 4-year-old girl who was swept away in the Provo River on Monday afternoon. Utah County sheriff’s Lt. Erik Knutzen said Tuesday that rescue crews are working to get to the body, which was discovered about one mile away from where the girl entered the river. Thirty-four-year-old Brenda DeDios immediately jumped in after her daughter. A good Samaritan, 30-year-old Sean Zacharey Thayne, of Sandy, Utah, also jumped in after the child. Rescue crews pulled the two adults from the water about 3 miles (4.8 kilometers) from where they entered. They both later died at a hospital. Utah officials say they are working to lower the water level of the Provo River in an effort to find a 4-year-old girl who was swept away Monday afternoon. Utah County Sheriff’s Sgt. Spencer Cannon said Tuesday that officials reduced the water at a dam at Deer Creek Reservoir about 10 miles away from where the girl went into the water to allow them to search the area. Rescue crews pulled the two adults from the water about 3 miles (4.8kilometers) from where they entered. They both later died at a hospital. Six adults leaped into the cold waters of a Utah river to rescue a 4-year-old girl who had been swept away Monday afternoon but two of the would-be rescuers — including the girl’s mother — died in the attempt. A witness tells TV station KUTV that London DeDios was sitting on a rock near the high river waters when she fell in the Provo River. Rescue crews pulled the two adults from the water nearly 3 miles (4.8 kilometers) from where they entered. They were taken to the hospital in critical condition and later died. ABC4 Utah reports that Timpanogos Park will be closed to the public Tuesday as they search.